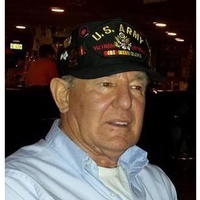 Walter Earl Goodrich, 77, of Middlebury Center, Pennsylvania passed away Sunday, March 24, 2019 at Advent Health, Wauchula, Florida. He was born June 3, 1941, in Elmira, New York to the late Earl and Cora (Wickham) Goodrich. He has spent the winters in the Frostproof, FL area for the past three years, attended the Methodist Church in Middlebury Center, PA and served in the Army during Viet Nam and Korea and traveled overseas during his time in the service. Survivors include his wife of seven years, Marie Goodrich; daughters, Colleen Houghtaling of Middlebury Center, PA and Kelly Harris of Murrells Inlet, SC; sister, Anna Mae Langley and her husband Bill of Aurora, CO; brother, Larry Goodrich and his wife Connie of Littleton, CO and 1 grandchild and 2 great-grandchildren.